NOTE: The 88 steering rack is unique to that year. 84-87 are different and can't have this particular problem described. One of our members had been complaining about hard steering on his 88 - including binding and clunking. A "professional mechanic" told him there was something wrong with the steering column internally. He brought it over so I could have a closer look at what was going on. The car was barely steerable. By the time we got it in the garage the steering wheel was upside down with the front wheels facing forward! Mechanic misdiagnosis - there is nothing wrong with the steering column. It was the rack itself. The pinion in the 88 rack has a ball bearing on the bottom end and a lock nut securing the shaft. A snap ring locks the bearing in the housing and a dust cap is pressed into the opening. This lower ball bearing has come apart and has literally "lost all its marbles". The binding and clunking were the pinion teeth jamming on the rack teeth, then jumping over by a tooth in the rack. This is the end of the pinion with dust cap removed. It did not fail because dirt got in the bearing. This end IS NOT open and exposed to water, road debris etc. It just looks like that because the old grease has dried out. That ring you see on the pinion shaft is the bearing's inner race. The outer race and snap ring are still in the housing. It's obvious this has been broken for some time to grind up the nut on the end of the shaft. I removed the snap ring and cleaned up the face of the outer ring. I haven't managed to find it or a cross reference to anything yet. See below - DON'T WANT factory part anyway. GM had similar problems with lower rack and pinion bearings on their other cars. SnapOn made a special tool to remove the bearing without having to remove and disassemble the rack. The Rack and Pinion lower pinion bearing can fail due to faulty original bearing. GM # 7828012 interchanges to Timken DB53313. This might be what you need? That manual diagram is curious because it is titled 7. Remove and install roller bearing assembly. But in the image the bearing is noted as a ball bearing assembly. The part number MrBlue87 provided is a roller bearing assembly that does not have an inner race. The dimensions you provided for the destroyed bearing don't match any common ball bearing. The closest I could find is a 6200 series ball bearing (the bearing part number will include 6200) which measures 10mm ID × 30mm OD × 9mm thick. I do not find a bearing with a 10mm ID and 30mm OD that is 8mm thick. Have you pulled the bearing remains out of the rack yet? Once you do remeasure the ID, OD and thickness. It is probably a common bearing size that could be replaced with any number of bearings from different manufacturers. Right on everything. Who the hell proofreads these things at GM - someone with no mechanical experience?? I've taken this apart now. There are TWO bearings for the pinion shaft. There IS a roller bearing and seal in the upper portion of the housing to center the pinion. They don't show the parts in the diagram, but they list the roller bearing and seal part number on Page 6.508-Group. Then in the diagram, they only show the 10mm x 30mm x 8mm BALL bearing at the lower end of the pinion shaft. They don't list a part number for that and again - GM uses a non-standard size (we all know about finding fuel line o-rings). After seeing how this one fell apart and the recall information on other cars with same problem, you would NOT WANT a "factory" part anyway. I used a 6200 series ball bearing - steering rack is fixed, probably permanently - owner is ecstatic! It tells you how to reassemble the rack properly so it is centered. Getting the 88 rack out is easier than on the 84-87 cars - less parts to remove. Once I got the wheels off and the tie-rods ends disconnected, it's just the 4 bolts for the 2 U-shaped brackets. The pinion just "fell out" if the rack because of that broken lower bearing. I disassembled it to clean it up and make sure no pieces of old ball bearing were inside housing. With the rack out, I was able to knock out the lower bearing outer race. Pieces of old ball bearing and new replacement pictured below. There should have been 8 balls - I only found 3 and nothing else. New bearing is seated into place (used a socket and hammer). When the old bearing broke, this end of the pinion shaft just flopped around. Because new bearing is 1mm wider than old bearing, slot for snap ring is partly covered. Snap ring slot in aluminum housing is easily grooved wider with a Dremel tool. I covered bearing with tape to avoid getting Dremel grindings in it. Here is snap ring installed. Below is shot where you can see both bearings. Upper end has a roller bearing and seal. New lower ball bearing that was just installed is seen at bottom. I packed grease into both bearings before reassembling the rack as per manual instructions, and reinstalling it in the car. Reposting the diagram of how this pinion and lower bearing go together. A nut goes on the end of the shaft and a pressed in dust cover seals the end from dirt/water. Is it probable that this could be the cause of my 1987 hard steering? Very hard to steer. Since I've never driven another fiero, I don't have any comparison experience. But, i wouldn't have bought a new one in 1987 if it steered as hard as mine does. No way for you to have this particular problem - 87 is a different rack. Start your own thread with more details (hard to steer is too vague) on what you are experiencing. Did you use a bearing that had no dust covers on the bearing? Personally I would have only used a bearing that had covers on both sides and had removable covers (snap rings). I would have removed one cover and packed the bearing with chassis grease, reinstalled the cover and then installed the bearing into the rack. No need for a sealed bearing. It will be obvious when you disassemble yours. The same reason you don't use an umbrella IN the house just because it's raining outside. The parts inside of the rack/pinion housing are all greased. The bearings are "in the housing" - not sure how you expect dirt to get into them. The upper pinion shaft roller bearing has a seal and the intermediate shaft dust boot covers the pinion shaft, pinch bolt, u-joint etc to the firewall. I have a solution for a replacement for the 10 x 30 x 8 mm lower ball bearing. I'll get going on that. Machining 0.5mm off each side would do it, provided it doesn't weaken the bearing races. They really used a non-standard size at the lower end? Maybe it was a standard size back in 84? Just finished "rebuilding" my steering rack on my 88 GT auto. 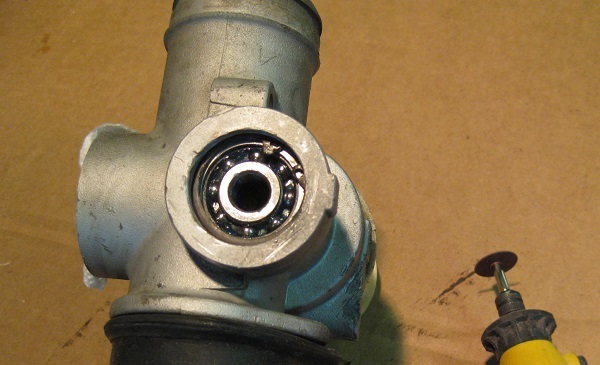 This info is invaluable to anyone repairing or refreshing the upper and lower pinion bearings. I had no idea how bad my steering had gotten until it failed me completely. With the new parts installed the car has literally transformed handling! Thanks for the walkthrough fierosound! btw did you ever find a suitable replacement seal for the upper part of the pinion gear? I found another post showing that a seal from a 90's Honda would work. I got one from Autozone and it fit great. Good to hear this helped. Maybe this breakdown isn't SO rare after all. ... did you ever find a suitable replacement seal for the upper part of the pinion gear? I found another post showing that a seal from a 90's Honda would work. I got one from Autozone and it fit great. Kinda vague. A part number would be better. Oops, yeah sorry bud. I didn't have my notes with me. I found National part# 222028 and it's a perfect fit. Maybe this breakdown isn't SO rare after all. My rack had the same symptoms and when i pulled off the press on cover the ball bearings and inner cage fell out. I could only find 7 of the 8 balls. I also had to dremel out another 1mm to get the snap ring back in. This is good information for 88 owners like myself. I will be adding this topic to my favorites. What year steering racks are interchangeable, if any? 84-87 interchange with each other. They can also be adapted between 88 and pre-88, but not bolt-in. ...thanks for the info there tony - now, you want to do mine (preventive)?? My garage is heated...and I have free beer. Where were you guys last year when I had my rack apart trying to find a replacement for that 1988 lower bearing?! For now I only have the lower bearing. Soon I'll have the upper bearing and seal. Excellent, will buy the full set as soon as you have them. I know this thread is a bit old, but has good info. I just wanted to add that I found a 10x30x8 bearing with chrome shields online, maybe rodney can look into stocking these, though I am not sure how easy it is to pack these with grease.